I think I have just solved the riddle of Caroline Scates' ancestry. I thought at first that her mother was Vashti Hathaway, who married Thomas Jeffery in 1810, and he died five years later at Waterloo leaving her with a son, Thomas Jeffery junior. Vashti then formed a relationship with Joseph Scates senior the bookseller and bore him a son, Joseph Scates junior, famous for concertinas, and four daughters: Eliza, Sophia, Ellen and Mary Ann. Joseph Scates died in 1854. Or did she marry him? I don't think so. Joseph Scates senior had married Mary King in 1793 and she did not die until 1845. They all are described in his will as being Jeffery, commonly called Scates. In addition Eliza is missing. We see that Vashti Jeffery is listed as a servant in his household in the census return for 1841, and we also know that Caroline Mary Ann Eliza Scates was born (allegedly) in Vienna in 1844. Was she the illegitimate daughter of Eliza who had gone abroad? And was her mother Eliza of course herself illegitimate? 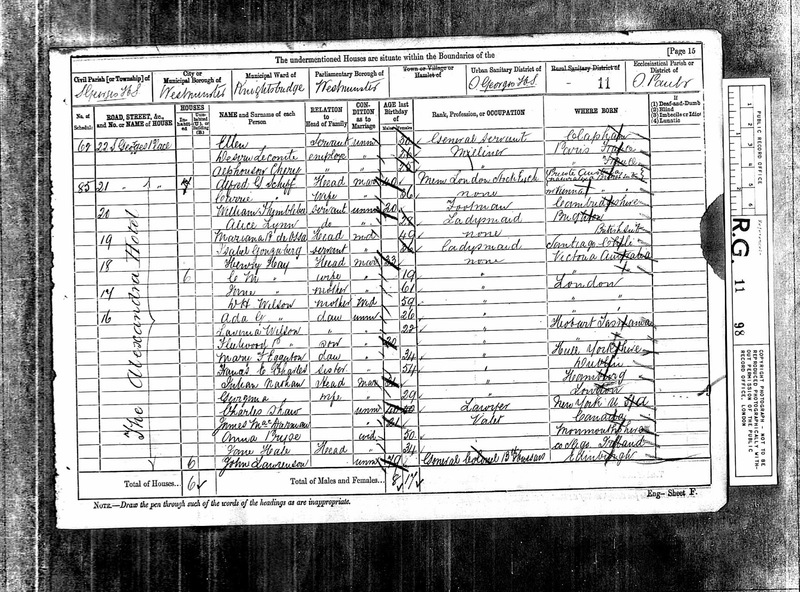 In the 1861 census Eliza appears to be married to James Prince, who was a witness with Eliza Prince at Caroline’s wedding to John Scott Cavell on 29th August, 1861. Eliza had married James in the autumn of 1853. Then Caroline Scates says in that marriage certificate that her father was Joseph Scates, deceased, gentleman, but I suspect that Joseph Scates was her grandfather, but Vashti Jeffery is very unlikely to have been her mother, as she would have been 52 at the time of Caroline's birth. 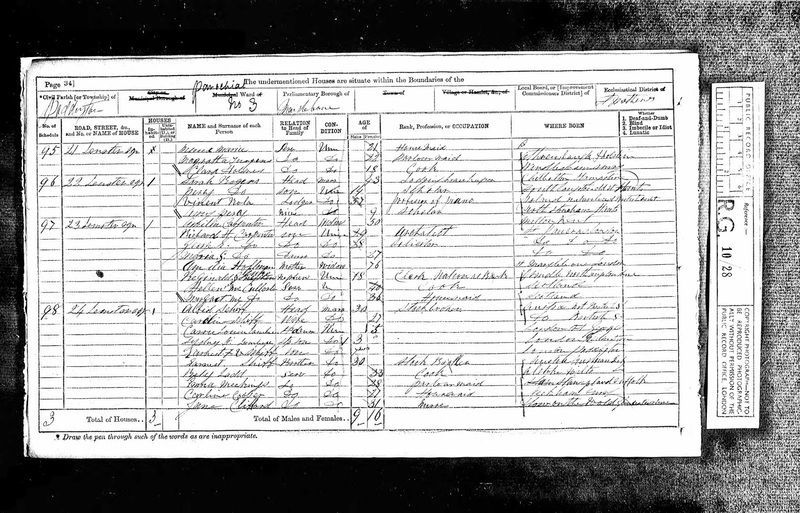 Also in the census return are Theodore Prince, born in Austria, Caroline Prince, born in Darmstadt (not Vienna, but undoubtedly her), aged 17. Caroline (Carrie Schiff) called her son Ernest Frederick Wilton Schiff, and the Wilton refers to John Wilton, the husband of her aunt Ellen Scates, alias Jeffery. John Wilton was the respectable relation, a surgeon, who married in 1863. There were rather a lot of skeletons in the cupboard, and of course Carrie’s own first two children were illegitimate. Sydney Schiff was always reticent about his mother’s family and relations, but does tell a story about them in 'Prince Hempseed', where he as good as admits that he knew nothing about them. Oh, and Carrie Schiff's firstborn daughter Carrie who married Sir Sydney Alexander named a daughter Muriel Vashti. Vashti is a rather rare forename. No wonder the Lowndes Squares were a tad aloof! I wonder how on earth Alfred met Carrie. From 'Prince Hempseed'But when I went to bed I lay awake thinking. How was it I had never heard my mother's name? The only members of her family I'd ever heard of were Aunt Mary who was the mother of my cousin Mildred, a very stout lady whose surname was Cunningham and a lady who lived with her whom I called Cousin Caroline whose surname was Steele and who was Sissy's godmother. They had a house in the country called Farnham Grange. In my whole life no one had ever mentioned what my mother's surname was though I remember her telling me that she had two Christian names besides Kate and that one of them was Millicent. Was there any reason for this or was it just chance? If only I had thought of it in time I should have told Miss Lynn her name was Steele. But now I've said it, I intend to stick to it until, if ever, I know the right one. After all, what does it matter? If her name were Burke or Vere de Vere, she couldn't he more aristocratic than she is. I hadn't the least intention of making her anything she wasn't and I couldn't make her out better than she is. In The Name of God Amen~ I Joseph Scates of No. 5 Sellwood Street in the parish of St. Mary Abbotts Kensington in the county of Middlesex do hereby certify that this is my last will and testament My debts I have none and I greatly desire to have a very plain and cheap funeral, to be buried in the cemetery opposite St . Marks College Fulham Road Middlesex. I give and bequeath to my servant Margaret Morrison the sum of £30 and as she has been very kind and attentive to me during the time she has been in my service I request that she may be paid her said legacy of £30 from the first sale of any part of my property and I have deposited in her hands my gold watch and chain with the three gold seals which the said Margaret Morrison will deliver up to my Executrix hereinafter named when she receives the said sum of £30 as before stated. Also I request that the said M. Morrison may be treated with respect and that she may remain in my house till after my funeral as I give this money to M. Morrison from not being able to pay her wages, or a very little. And to Joseph Jeffery commonly called Joseph Scates the sum of £5 as he has received much of my property some years since, and as to all the rest, residue and remainder of my Estate and effects of whatsoever kind and wheresoever situate I give & bequeath the same and every part thereof unto Vashti Jeffery the widow of Thomas Jeffery who was killed at the Battle of Waterloo, Eliza Jeffery, commonly called Eliza Scates, Sophia Jeffery, commonly called Sophia Scates, Ellen Jeffery, commonly called Ellen Scates and my legitimate daughter Elizabeth Scates their respective heirs, executors, administrators and assigns to be equally divided between them and as there may be some doubt whether my said daughter Elizabeth can be found I desire my Executrix hereinafter named to advertise 3 times in card of the 3 best public papers for the said Elizth. Scates, but should she not be found within 1 year after my decease then I give and bequeath her share of my property unto the said Vashti Jeffery, Eliza Jeffery commonly called Eliza Scates, Sophia Jeffery commonly called Sophia Scates, and Ellen Jeffery commonly called Ellen Scates, their respective heirs, Executors, Administrators, and Assigns to be equally divided between them and as I have worked very hard for the little I have left I hope that my said several legatees will all make the best use of it and I hereby appoint the said Vashti Jeffery sole Executrix of this my Will and hereby revoking all Wills by me at any time heretofore made. I declare this only to be my last Will and Testament In Witness whereof I have hereunto set my hand this thirtieth day of August A.D.1850.- Joseph Scates - signed by the above named Joseph Scates in the presence of us both present at the same time and we in his presence at his request & in the presence of each other have hereunto subscribed our names as Witnesses - John Thomas Wilkins 6 vj Grays Place Brompton – Thomas Hatchett of No.1, Holles Place Chelsea PROVED at London 25th August 1855 before the Worshipful Frederick Thomas Scott doctor of Laws and Surrogate by the oath of Vashti Jeffery, Widow the sole Executrix to whom Admin was granted having been first sworn duly to Administrate.